The Muslim Rohingya of Myanmar have been persecuted by the Burmese government since the 1980’s. They have been refused citizenship in the country of their birth and are considered stateless. In 2012, tensions between these Muslims and their Buddhist peers, who represent the majority in Burma, exploded, leaving 140 dead and displacing nearly 140,000 Rohingya. To date, an estimated 1 million Rohingya have fled Burma including 2,000 who were recently rescued from sea by Indonesian fishermen. In light of the Myanmar exodus, Uni Papua has spread its Football4Humanity program to the Indonesian Island of Sumatra where many Rohingya migrants live in temporary camps. Football4Humanity distributes soccer equipment and organizes structured competitions. It also uses sport to help teach vital lessons including HIV/AIDS prevention and conflict resolution training. The organization also works to improve relations among the young refugees in the Sumatra camps. Aged 10-to-18 years, these 140 young refugees come from two villages in Myanmar. While fleeing their homeland, they spent months aboard small ships fighting over limited food, water, and other supplies. Football4Humanity forms mixed teams from the two villages, and plays games that foster trust and communication among the children. One game in particular showed heartwarming results. In a derivative of soccer, which requires players to hold hands during the action, 16 year old “Blackjack” was paired with a partner from the rival village. When they both fell down, Blackjack quickly rose to give his partner a hand up. Their cooperation and subsequent friendship was a powerful symbol for elder village members who still wished to keep their communities separate. 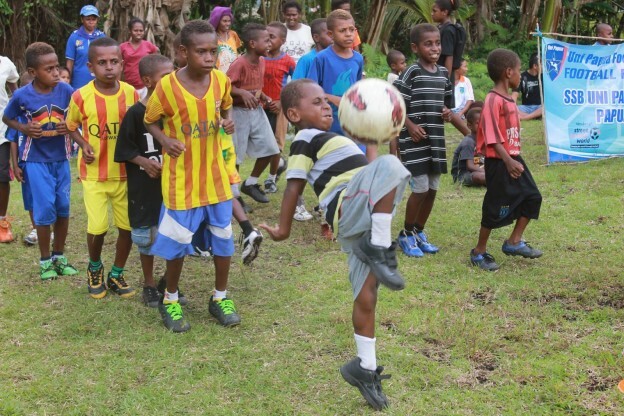 Football4Humanity is yet another example of the cohesive power that sport can exert. In addition to easing tensions between rival villages, their games and activities offer much-needed respite to children who have undergone unimaginable trauma. Uni Papua currently has 23 branches in Indonesia, and intends to bring sport to many more communities in the future. This entry was posted in Good Sports on September 9, 2015 by Mike Weinstein.